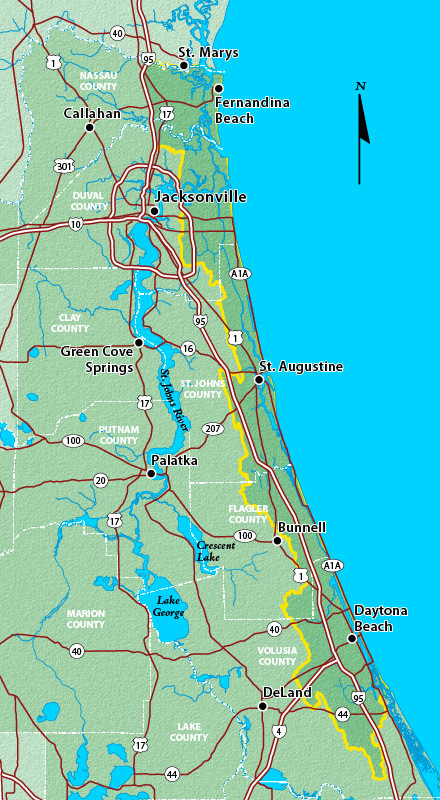 The Northern Coastal Basins stretches along the northern Atlantic coast of Florida, extending approximately 125 miles from the St. Marys River and Amelia Island in Nassau County, south through the coastal watersheds of Duval, St. Johns, Flagler and Volusia counties to Ponce de Leon Inlet, near the city of New Smyrna Beach. 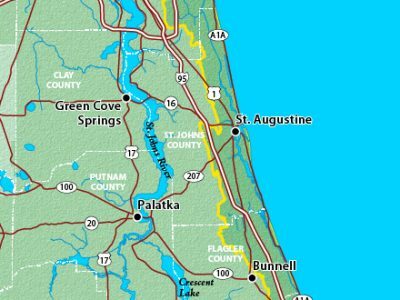 The basin covers all the watersheds that drain toward the Atlantic coast between the Spruce Creek watershed near Ponce Inlet in Volusia County and the Guana River watershed in northern St. Johns County. Water resource challenges in the basin range from stormwater runoff to leaking septic systems to boat wakes. The St. Johns River Water Management District, local, regional, state and federal agencies have come together to address issues such as flooding, water quality (particularly in shellfish harvesting areas) and protection of coastal saltmarsh resources. Interagency work groups are guiding efforts to develop and monitor resource baselines and to coordinate resources and funding for development and implementation of regional watershed management initiatives. Among this work, the district developed a watershed-based Surface Water Improvement and Management (SWIM) Plan to enhance, restore and manage the water quality and wetland resources within the basin’s estuaries. The district’s Governing Board adopted the SWIM plan in 2003 and the Northern Coastal Basins was designated as an official SWIM program. District staff continue to update the agency’s work plans, as needed, to implement the SWIM Plan activities, which include a water quality monitoring network, tracking and evaluating stormwater management to provide technical assistance to help guide local government stormwater retrofit projects, work with local leaders to collect and evaluate compliance with permitted stormwater treatment systems, and collect, map and evaluate datasets for resources and habitats used to develop and implement restoration activities.